Mj Rodriguez & Nico Santos announced the nominees for the 30th Annual GLAAD Media Awards at the Sundance Film Festival. Sarah Kate Ellis, GLAAD President & CEO stated, "The images & stories recognized by the GLAAD Media Awards over the past 30 years raised the bar for LGBTQ inclusion in the media industry & changed the hearts & minds of countless audience members around the world. This year's nominees are changing the game by showcasing diverse races, genders, religions, ages, geographies & genres in ways that challenge misconceptions & inspire LGBTQ acceptance. The 30th anniversary of the GLAAD Media Awards will honor these groundbreaking new LGBTQ stories while remembering the astounding positive cultural change that LGBTQ media representations have achieved." GLAAD announced 151 nominees in 27 categories including an inaugural category for Outstanding Video Game along with Kids & Family Programming, Comedy & Drama Series, Documentary, Reality Series, Music Artist, Comic Book, print, broadcast & online news & five Spanish-language categories. For the first time ever, the GLAAD Media Awards' Outstanding Film – Limited Release category expanded from five to ten nominees as a result of a welcome increase in fair, accurate & inclusive LGBTQ images in film. Special Honorees for the 30th Annual GLAAD Media Awards will be announced in coming weeks. 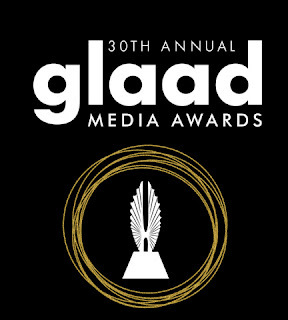 The GLAAD Media Awards ceremonies which fund GLAAD's work to accelerate LGBTQ acceptance will be held in Los Angeles on Thursday, March 28th at The Beverly Hilton & in New York on Saturday, May 4th at the Hilton Midtown. Thanks to Sarah Kate Ellis and GLAAD for their fierce advocacy for diversity in the Media. Hearts and minds change when people see that we all have the same dreams and hopes.